Of course, you can buy trees that are cheaper. You can always buy something cheaper. But is it really cheaper, and is it worth it, when it’s something like a tree that will be with you for half a century, that will improve your garden and increase the value of your property, and will provide you with the pleasure of blossom and fruit year after year? The fruit trees that we sell are Bush trees, well-developed specimens with useful side branches to encourage early cropping. This is why, with our trees, cropping usually begins the year after planting. They are sturdy, strong and healthy, with good levels of reserves in the tree structure. This helps them to resist diseases caused by the fungal spores that are always present in the air. Other suppliers may seem to have prices lower than ours, but this is because the trees that they supply are Maidens (the first-year, twiglike trees referred to by the customer quoted above), without all the advantages offered by Bush trees. We concentrate on the supply of well feathered 2 and 3 year old trees. We also sell maiden trees but only when well feathered with side branches. As a last resort we will sell single stem maiden trees, if the older trees have been sold out. In other words, the real difference, with Suffolk Fruit and Trees, is our support and expert advice. 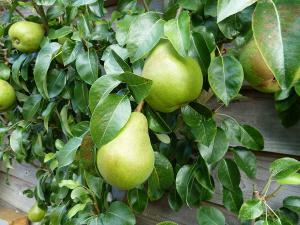 Our aim is to ensure that your fruit trees thrive and provide you with fruit as soon as possible, and for years to come. Our advice begins with ensuring that your choice of trees from our extensive selection will work well, whether they are for a patio pot, garden or orchard. After your purchase, our after-sales service provides assistance and tips on planting, getting the trees to grow well and crop as soon as possible, and personalized advice on what to do if unexpected difficulties arise.